How can I export my fonts? I seem to have loads of fonts on my computer. Can you suggest some way I can manage them? I’m particularly interested in being able to download them and move them from one computer to another? Here’s a cool little program you can use for just that. 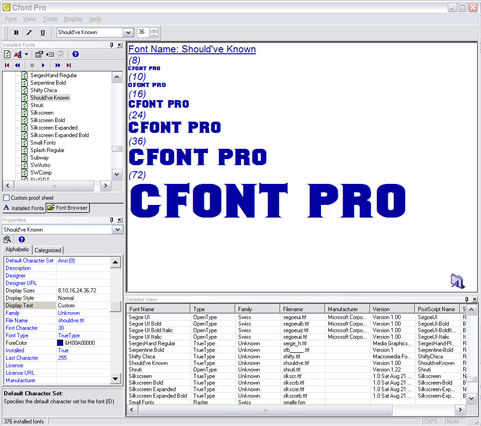 It’s called Cfont Pro and it’s a free program that has some cool font-related features. 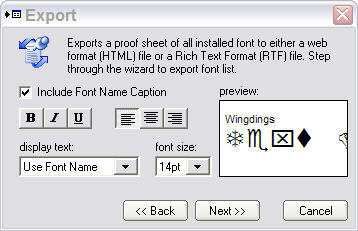 Besides letting you look at all your fonts, looking at a complete character map and seeing a proof sheet, it also lets you package up fonts so you can transport them from one computer to another. This is the main screen and here is the one that you can use to export your fonts. The program also has an option to zoom into each and every character on the character map, in fact it can blow it up so large that you may need Wayfarer sunglasses to protect your eyes. Check it out. ← Previous Previous post: Where can I find my IE favourites? Next → Next post: Sounds I install ActiveX Controls on my computer? Awesome news and i haven’t heard that there will be a tool that produces fonts and can also be changed to one system to another..